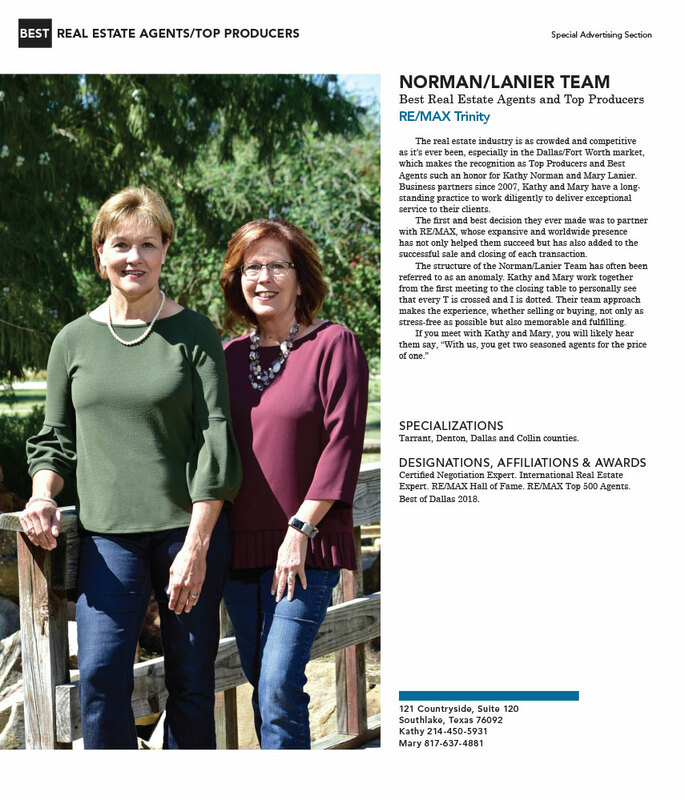 The real estate industry is as crowded and competitive as it’s ever been, especially in the Dallas/Fort Worth market, which makes the recognition as Top Producers and Best Agents such an honor for Kathy Norman and Mary Lanier. Business partners since 2007, Kathy and Mary have a longstanding practice to work diligently to deliver exceptional service to their clients. The first and best decision they ever made was to partner with RE/MAX, whose expansive and worldwide presence has not only helped them succeed but has also added to the successful sale and closing of each transaction. The structure of the Norman/Lanier Team has often been referred to as an anomaly. Kathy and Mary work together from the first meeting to the closing table to personally see that every T is crossed and I is dotted. Their team approach makes the experience, whether selling or buying, not only as stress-free as possible but also memorable and fulfilling. Tarrant, Denton, Dallas and Collin counties.